3 Epigenetic Reasons to Meditate Your Stress Away | What is Epigenetics? Feeling stressed? You’re not alone. According to the American Psychological Association, people are living with stress at levels higher than what is considered healthy. Unsurprisingly, the APA found the top four sources of stress to be money, work, family responsibilities, and health concerns. Are you nervous about that project that’s due this week? Worried about the last of your sample that’s incubating in the lab? Perhaps you’re just convinced money is some sort of mythical object that you might one day catch a glimpse of. Or maybe you’re wondering how you might engineer a time machine to bring your daughter to jiu jitsu practice and pick up your son from daycare at the same time you’re supposed to be at your doctor’s appointment? Even if none of these scenarios begin to scratch the surface for you, there is still hope for reducing the stress in your life. As we all know, too much stress can take a significant toll on your health. Not being able to cope with stress can lead to chronic diseases and accelerated aging (but don’t think about that too much, or risk adding it to your already lengthy list of stressors). What you should think about, though, is turning to an ancient practice that reduces stress and improves your health. Epigenetic research is actually finding that the years-old act of meditation, particularly mindfulness meditation, has numerous health and stress-reducing benefits. Check out free guided meditations from UCLA Mindful Awareness Research Center for different meditation walkthroughs! Epigenetics is an ever-growing field of research that focuses on the chemical modifications made to DNA that change phenotype without altering the underlying genetic sequence. DNA methylation and histone modifications are two of the most common epigenetic mechanisms that impact gene expression. New scientific studies are supporting and describing the molecular changes and epigenetics-related benefits that are linked to meditation. Mindfulness meditation could epigenetically reduce the harmful effects of inflammation. Chronic inflammation is connected to a host of issues – depression, Alzheimer’s disease, cancer, and obesity, just to name a few. Based on research from a group of international scientists, meditation may be able to stave off this detrimental inflammation. Mindfulness meditation is based off of Buddhist practices that emphasize aligning one’s focus with the present in a nonjudgmental way to increase awareness, calming the mind and body. 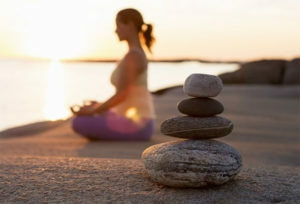 While investigating blood mononuclear cells, researchers found that a day of intensive practice of mindfulness meditation by experienced meditators was linked to reduced expression of histone deacetylase genes (HDAC2, HDAC3 and HDAC9) which are thought to modulate inflammatory pathways, and decreased expression of two pro-inflammatory genes – RIPK2 and COX2 . These meditators also experienced changes in global histone modification, specifically histones H4 pan-acetyl (H4ac) and histone H3 trimethyl Lys4 (H3K4me3), and demonstrated faster cortisol recovery to the Trier Social Stress Test (TSST). 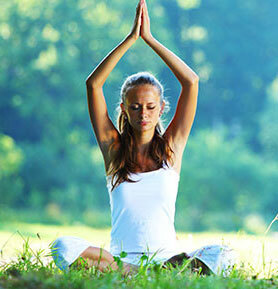 By meditating frequently, you may physically recover better from stress and reduce harmful inflammation. Although further research is needed, this evidence suggests that meditation could be influencing HDACs and inflammatory pathways in ways similar to that of anti-inflammatory drugs such as histone deacetylase inhibitors (HDACi). Not only can meditation reduce inflammation, it may also protect parts of your chromosomes that are central to gene expression. Telomeres, the protective end caps on chromosomes, and the enzyme telomerase, which helps to rebuild and lengthen telomeres, are important to health and have been previously implicated in epigenetics. Their length has been shown to influence whether target genes are switched on or off  and telomerase activity is thought to be linked to psychological stress and physical health . But by simply meditating, you may be able to maintain telomere length and actually increase telomerase activity. In a study published in Cancer, researchers found distressed breast cancer survivors who engaged in mindfulness meditation could maintain their telomere length, but those that didn’t undergo meditation actually saw their telomeres decrease in length . Telomere dysfunction or shortening has been connected to the development of tumors and linked to bladder, bone, lung, and kidney cancer. Telomeres are also reportedly shorter in people with diabetes, heart disease, high stress levels, and they may predict diseases that are regulated by psychological stress. Based on this preliminary research, people who are feeling stressed might be able to improve their telomere length and telomerase activity by meditating, possibly positively influencing gene expression and alleviating stress levels. Recent studies investigate yoga and its epigenetic effects related to DNA methylation. Recent research suggests that meditation and other similar lifestyle changes may also be able to reduce the risk of cancer. A small study done by Dr. Dean Ornish and scientists at University of California, San Francisco found that men with low-risk prostate cancer who underwent an hour long breathing and meditation exercise every day along with other activities like yoga or walking had decreased expression in genes associated with cancer . Specifically, the research team found that RAS family oncogenes (RAN, RAB14, and RAB8A) were down-regulated as a result of the activities. Although this was only a preliminary study, research indicates that hypermethylation of CpG islands often results in the epigenetic silencing or inactivation of genes related to the development of cancer  and various covalent modifications to histone proteins, such as phosphorylation, acetylation, or methylation, are implicated in crucial physiological and pathological processes, including tumorigenesis. Histone modifications, alongside other epigenetic mechanisms like methylation of CpG islands, may go hand-in-hand in regulating gene activity, including transcription, repair, and replication, and can impact cancer and disease development . Pathway analysis revealed significant modulation of biological processes involved in tumorigenesis, suggesting that meditation may actually molecularly mitigate the processes that play a role in developing cancer. These changes as a result of meditation lend more evidence to the very foundation of epigenetics – that the environment or other external factors could impact DNA expression and phenotype regardless of one’s existing genetic sequence. Their results showed down regulated pathways involving protein metabolism and modification, intracellular protein traffic, and protein phosphorylation which occurred as a result of the meditation and other activities. It seems unusual that something as simple and easy as meditating could improve your health, but these studies demonstrate an epigenetic link between meditation and its potential disease-reducing benefits. Next time you’re feeling stressed, take some time to breathe and you may be surprised at just how effective meditation could be. Carlson, L. E., Beattie, T. L., Giese-Davis, J., Faris, P., Tamagawa, R., Fick, L. J., Degelman, E. S. and Speca, M. (2015). Mindfulness-based cancer recovery and supportive-expressive therapy maintain telomere length relative to controls in distressed breast cancer survivors. Cancer, 121: 476–484. Epel, E., Daubenmier, J., Moskowitz, J.T., Folkman, S., Blackburn, E. Can meditation slow rate of cellular aging? Cognitive stress, mindfulness, and telomeres. Ann N Y Acad Sci, 1172: 34-53. Esteller, M. (2006). Epigenetics provides a new generation of oncogenes and tumour-suppressor genes. British Journal of Cancer, 94(2), 179–183. Kaliman, P., Álvarez-López, M.J., Cosín-Tomás, M., Rosenkranz, M.A., Lutz, A., Davidson, R.J. (2014). Rapid changes in histone deacetylases and inflammatory gene expression in expert meditators. Psychoneuroendocrinology, 40: 96-107. Ornish, D., Magbanua, M.J., Weidner, G., Weinberg, V., Kemp, C., Green, C., Mattie, M.D., Marlin, R., Simko, J., Shinohara, K., Haqq, C.M., Carroll, P.R. (2008). Changes in prostate gene expression in men undergoing an intensive nutrition and lifestyle intervention. PNAS, 105(24): 8369-8374. Robin, J.D., Ludlow, A.T., Batten, K., Magdinier, F., Stadler, G., Wagner K.R., Shay, J.W., &. Wright, W.E. (2014). Telomere position effect: regulation of gene expression with progressive telomere shortening over long distances. Genes & Development, 28: 2464-2476.